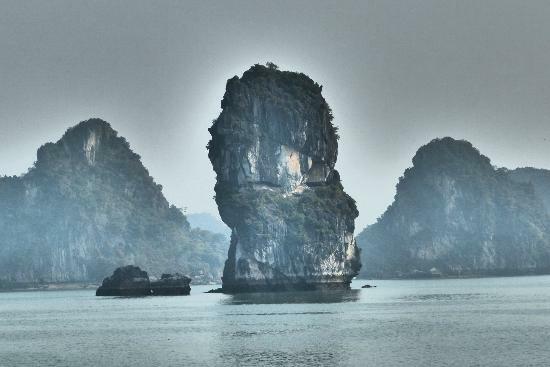 The Dragon Legend Junk offers trips to Bai Tu Long Bay in the less touristy area, and the itinerary is well off the beaten track. 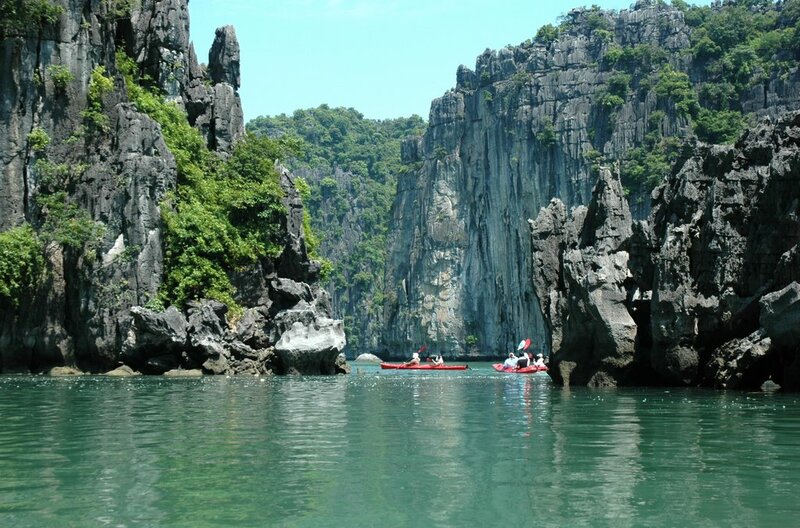 The three day two night cruise to untouched Bai Tu Long Bay is ideal for you to discover natural beauty and local life in a limited time schedule, you will get to visit a cave, go kayaking, visit a floating village, and have a BBQ lunch on beach. This trip takes you deep into natural wonder and experience a memorable night in the majestic bay. This package also includes a stop at Yen Duc village in Dong Trieu province where you will be treated to a water puppet show. Yen Duc is a typical Vietnamese agricultural village which is rich in culture and traditions. Each of the 24 spacious, wood-paneled cabins has been luxuriously designed for the comfort and enjoyment of our guests. The beautifully presented furnishings in each 26.5 square meter cabin are influenced by traditional Vietnamese culture and comprise a collection of authentic, handmade art from different regions throughout Vietnam (Chu Dau ceramics, Red Zao brocade, wooden statues…) The well-appointed, 9 square meter bathrooms include bathtubs for a soothing seawater or fresh water treatment where guests can relax and gaze out on the Bay from a large window. Two of the cabins have connecting rooms to accommodate families. 12:30 – 13:00: Check-in, enjoy the welcome drink and cruise briefing. 13:30 – 14:30: Have lunch in the outdoor dining room (weather permitting) while cruising to magnificent Bai Tu Long Bay. You will be able to admire the fascinating formations along the way. 17:30: Back to the boat, where you can refresh yourself in the outdoor or indoor Mineral Seawater Pool, Fitness Room or enjoy the spa and massage services while cruising to Cap La area. 20:30: Free time for relaxing, communicating with the staff, evening activities (watching movies, listening to music, squid fishing…). Overnight in Bai Tu Long Bay. 07:00 – 08:00: Start a new day with Tai Chi on the sundeck and enjoy the morning view of Bai Tu Long Bay's landscape with a cup of tea or coffee. 08:00 – 08:30: Have breakfast in the fresh air (weather permitting) while cruising to Vung Vieng Fishing Village. 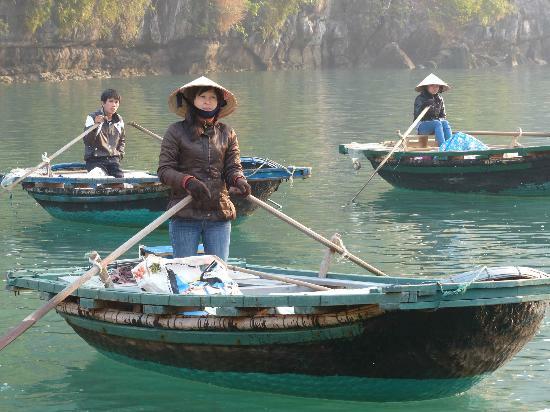 9:50: Visit Vung Vieng fishing village on a rustic row-boat. Meet the local people and pass through the floating houses and fish farms. 12:30: We'll stop to enjoy a BBQ lunch on the beach. 19:00: Have a gourmet dinner on board. 20:30: Free time for communicating with staff, evening activities (squid fishing, beauty spa…). Overnight on board. ​07:00: Start your day with a cup of tea or coffee. Have breakfast in the fresh air. 9:30 – 10:00: Start cruising towards the harbor. Enjoy the scenic on the way. Time to pack and check out of your cabin. - This itinerary is subject to change without prior notice. Please get final confirmation before your departure.